Cardinal Mundelein tapped a group of prominent Catholic businessmen from Chicago including Dennis Francis Kelly, president of Mandel Brothers and The Fair Store; Edward Hines, president of Edward Hines Lumber Company; Charles Comiskey, founder and owner of the Chicago White Sox; Robert M. Sweitzer, Cook County Clerk; and many other heavyweights of the business and government community. This group, formally chartered in 1918, laid the groundwork and began the fundraising for what is now Catholic Charities of the Archdiocese of Chicago. 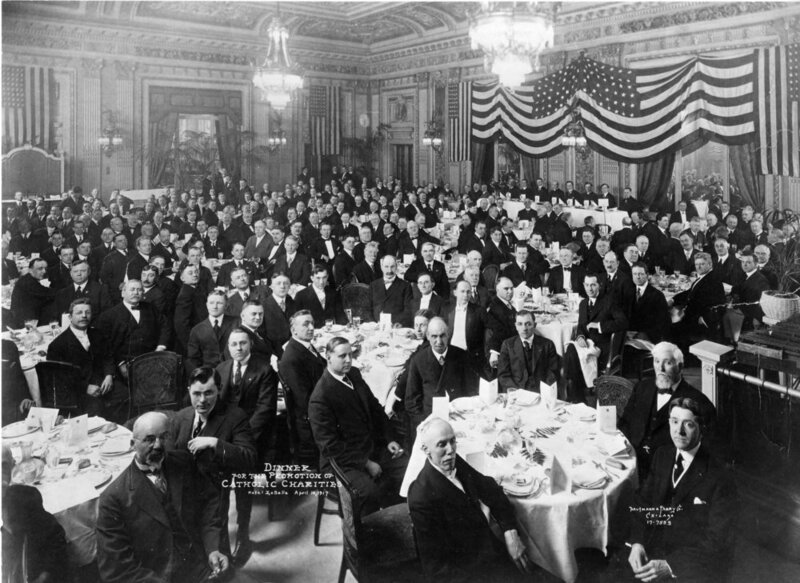 The first annual meeting of the board of advisors in 1918. Downtown Chicago in the early 1900s. In the nation’s second largest city, one made up of immigrants from around the world, including tens of thousands of Catholics, local parishes were burdened by the needs of the poor in their communities. Spanish influenza was sweeping the globe and women and children were left without husbands and fathers following World War I. The centralized fundraising arm of the Church quickly became a social service provider for the most vulnerable and desolate. “During the past 12 months, 50,000 people in this city and diocese have contributed their money, their time, and their services that we might efficiently carry out these works of mercy, that we might feed the hungry, nurse the sick, protect the orphans, shelter the homeless, and help the poor in our midst." regardless of background, religious affiliation or no religion, or nationality. We remain nimble to the evolving needs of our clients, focusing on the varied needs of each community we serve. Our approach allows us to respond quickly and our network of more than 400 community partners and 200 parish partners help us provide the best and most cutting edge programming to answer these needs. What started as a fundraising arm of the church has evolved to providing direct support and services to nearly 1 million people. Programs range from providing the most basic of services such as housing and food, to caring for our children, maternity and adoption services, after school programming, senior support, affordable senior housing, counseling and case management, veterans employment and housing, and family strengthening. When you walk through our doors or call our offices, the only question you will be asked is “how can we help you” and from there our staff will work to help an individual or family become as self-sufficient as possible through a holistic approach. The first Board of Advisors prays for Catholic Charities clients and staff. During the Great Depression, Catholic Charities was a key partner in a region-wide effort to aid families struggling with long-term unemployment. The agency became known for feeding the hungry and caring for orphans. During the “War on Poverty” in the 1960s, the agency opened some of the first Head Start programs. Through the 1990s and into the 21st century, the agency has expanded its programming for seniors and affordable housing. At the same time, the government turned to Catholic Charities for guidance with its food distribution program, Women, Infant and Children centers. Catholic Charities opened the nation’s first WIC Stores, serving as a model for eliminating fraud in the federal program. As new initiatives and partnerships take hold, the agency remains committed to providing core services in emergency assistance, counseling, addiction services, employment and job training, and housing.